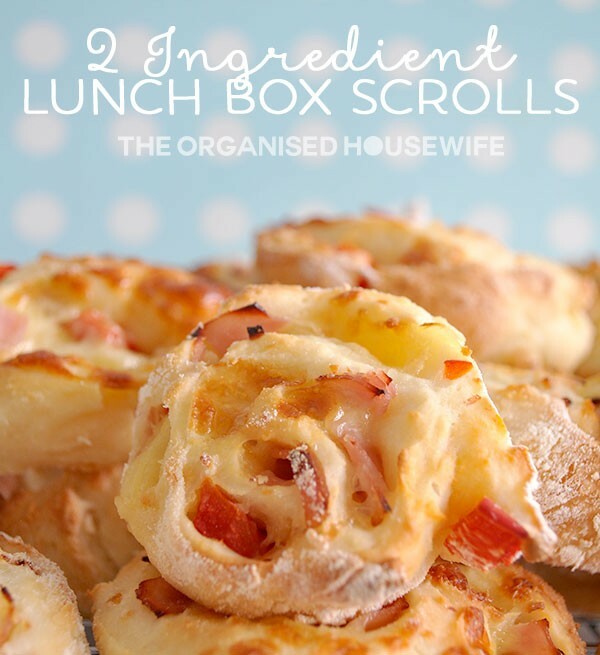 If you want to make some fresh scrolls for lunch at home or lunch boxes, this is a really fast and easy recipe. Equal parts self raising flour and greek yoghurt, that’s it!! Mix ingredients together into a bowl to create dough. I add a little more flour if the mix is too sticky. Roll out onto a floured flat surface. I have made a double batch below and created a different variety of scrolls. One side is ham, capsicum, pineapple and cheese, the other ham and cheese. Then roll up and slice into 2 cm thick segments, bake on baking tray until golden, approximately 15-18minutes. Mix flour and yoghurt and make a ball. Knead for a few minutes, adding more flour if mixture is too wet. What flavours do you add to your scrolls? Yes absolutely, I place them frozen into the kids lunchboxes. This particular recipe isn’t as good as it would be fresh, but still freezeable. Rachel, you could use other yoghurts. I simply like the taste of greek yoghurt. Someone also mentioned that you could use cream too. So cream in equal amount as the youghert ? This looks yummy and easy. My fav combo. Just a question, what is self raising flour? Hi Elixabeth, usually in the US you would use plain flour, salt and baking powder. Thanks Katrina. I Googled it to get the ratio. I made these with Gluten Free SR flour and they worked well. Stickier dough so I added some extra flour. My mum has made these for years, the recipe is in Cookery the Australian Way. It uses a scone dough as the base which would solve problems for any LACTOSE FREE people. As a sweet treat, one of its toppings is brown sugar and butter which makes caramel scrolls. I am going to try this wit GF flour and coconut yoghurt. We shall see how it goes. Using up my left over ham from Xmas to make them. ooh let us know how it goes! yes. I made them gf. I just upped the flour to 350g. The 1st time they were a bit damp. And extra flour when you roll out. Yes these can be made with gluten free flour and will taste the same, the only difference is that the flour doesn’t brown, it generally stays white. Try and add a teaspoon of bicarbonate of soda to the flour. Should make it brown loke normal flour. Can you use low fat Greek yogurt or openly full fat? I’ve only ever used the yoghurt pictured, but I can’t see why not. Would coconut or almond flour work? What a fab recipe. 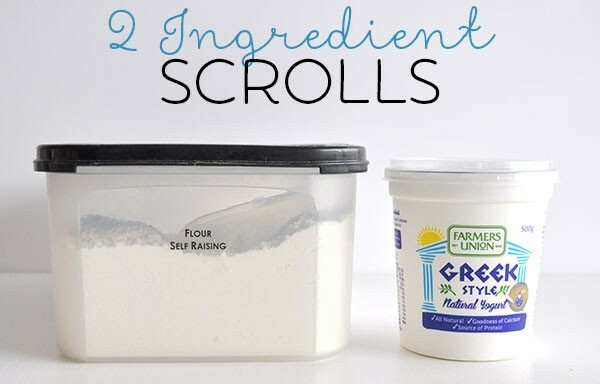 I’m going to try some sweet scrolls with this recipe too. I’ll just add a little sugar to the base then some apple, brown sugar and cinnamon to the center, the sweet possibilities are endless too! Choc chips, jam, dried fruit etc would all work I think! I have used this dough recipe for quick and easy midweek pizzas for a while now. The kids love it as does my husband. It’s an awesome dough recipe isn’t it? I’ve used it pretty much since it turned up on Kidspot. Also Gourmet Girlfriend did a version with plain flour to make Gozleme, also super YUM! Did you make the quinoa flour self raising by adding any other ingredients? My daughter is lactose free could you use lactose free yogurt?? Delish and SO easy! I made with ham, cheese and carrot – for my sandwich loathing 8 yr old son’s lunch box. Thumbs up! Can natural unsweetened yoghurt be used instead of Greek? These are brilliant! I had inadvertently purchased some sweetened greek yoghurt and this was a great way of using it up. Apple, Cinnamon & Sugar and Jam made two great variety of treats for morning tea! I use this same recipe for a quick last minute pizza base! My son also taught a group of friends at university how to eat on the cheap! Just made a batch of these for school lunch boxes. Mu husband keeps pinching them and his comment was “these are really good” and my kids agree. Glad I came across your blog….just love it and all the ideas. You can substitute soy yoghurt for dairy yoghurt in almost any recipe, in my experience. Great tip!Thanks for sharing Bettina. Amazing and ridiculously easy even if a bit messy! I did 3 batches because someone ate half of the first batch within 5 minutes! Easy and yummy is a good combo for a busy mummy!! Ok – they look delicious but at what temperature do you bake them? 185C? Do you have to refrigerate them or can they stay out on the bench in a container? Good question, I put mine in the fridge, only because I live on the Gold Coast and it’s been really hot here, however they are fine in the kids lunch boxes through the day. Would it be possible to make larger scrolls (like the ones you see at a certain Australian bakery chain), or would these only really work as the small 2cm things you’ve made here? Size depends on how you roll them out. Should be able to make same size as bakeries. Absolutely! I think they would be fine. 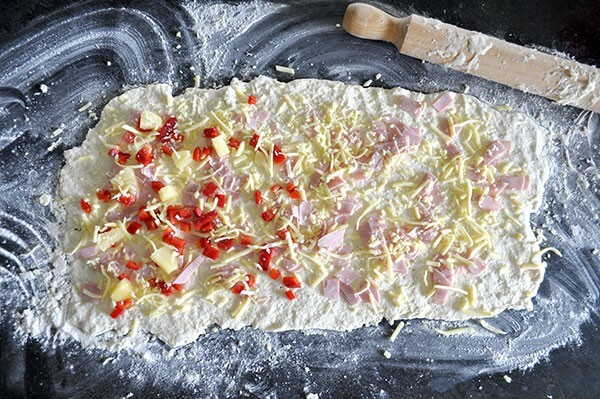 When using as a pizza base, my mum always put a hand full of cheese in the dough too just to add to it. Ooh yum! That sounds delicious, Karena! Could you use sour cream instead of yoghurt? Yes you can. Any alternate method of making scone dough is possible. Cream for a rich dough, lemonade for light and fluffy. I’d like to try Vegemite and cheese, though can’t imagine that it would be easy to spread Vegemite on the dough… Any tips?? You can put the Vegemite in a microwave jug (eg Pyrex) and soften a bit. It is really hard to spread that thickly without breaking the dough, but luckily you don’t really need it very thick. The first time I ever did them I used way more Vegemite than necessary, and although the kids loved them, it made me gag! Vegemite is NOT gluten free @ Suzie. Can I make the dough the day before? Or can I make it and freeze it? Would sweet fillings work with this dough for example cinnamon and sultana etc? These are great! 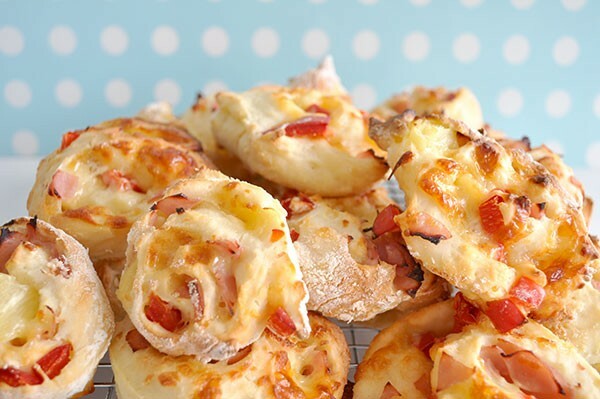 My children absolutely love them and they are a much healthier alternative to the cheese and bacon roles sold in the supermarket. I use wholemeal flour for a little fibre boost. I did find however the first time I made them they stuck to paper lining the tray which was super annoying to then have to peel off. The nest time I just used a lightly greased tray and they came out fine. Thanks for sharing! Oops, I meant cheese and bacon ROLLS! Just made these for the first time. Tip – put the scrolls onto the oven tray with the ingredients facing up, like you are looking down into the scroll – I didn’t and now have scrolls that looked like filled dumplings! Lesson learnt. I made scones using this recipe by just adding sultanas – yummo, so light and so so easy! so i get to indulge without feeling guilty about them having sugar, cream and butter in them. I don’t know how I could get something so simple so wrong but no matter how much flour I kept adding I just had a sticky mess. It wouldn’t form into dough. I reckon I ended up adding another whole cup of flour. Anyone else have this problem? put cup of flour in first then only add greek yogurt spoon by spoon as needed. remove any water from yogurt first. How do you remove water from yoghurt? I only use half the yoghurt (or cream!) then add a little more if necessary. I find the equal parts flour and yoghurt is way too wet. I’ve been using this recipes for a few years as pizza dough too – works well! have taught the kids to make these – 1 part yoghurt to 2 parts flour – roll out and pizza ingredients on top – tomato paste, olives, pepperoni or bacon and cheese. 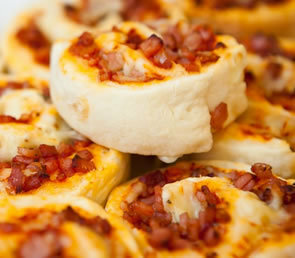 We make lunch sized scrolls which are perfect for school. For Celiac’s could you change to using GF flour instead? Has anyone tried wholemeal SF flour? They would be great with wholemeal, I would think they may need a little extra greek yoghurt, you’ll be able to tell when you mix it together if the mix is too dry? How could you turn it gluten free? I’m not entirely sure Narine sorry, I hope another reader maybe able to help you. This recipe popped up on Facebook. Too easy! They are so quick and easy, my Dad was over yesterday while I was making them to freeze for kids lunches and he said, that’s really easy I could do it….. I was excited to hear that as he’s not much of a cook. Just wondering how you freeze your scrolls?? May seem like a silly question, but do you zip lock bag them individually or in groups of 2 or 3?? Do they get freezer burn?? Are they soggy when they defrost in the kids lunchboxes?? I always make sure I use parmesan cheese or similar as there is a big hit of flavour & not much fat. Sometimes I use jam & coconut, and also add a bit of coconut to the dough. Sometimes I make these for dinner – make the dough, put out bowls of filling choices & let the kids go for it. They get a dinner they like & I get a night off – everybody wins. I also make pizza-pockets from this dough. It works so well. Love the idea of Jam and Coconut, yummo!! absolutely Victora, freeze them and pop them frozen into lunchboxes and they will be defrosted by lunch time. I have just made this recipe ready for school tomorrow. I found that I needed almost two cups of flour to one cup of greek yoghurt. I live in the UK and it is raining today. Maybe this is why? I know flour’s asorbancy varies with climatic conditions. They are in the oven right now…looking quite good! can I store these for the next day?